Reaching the milestone for an anniversary is always cause for celebration. Even a one month anniversary is an achievement and something to be admired. 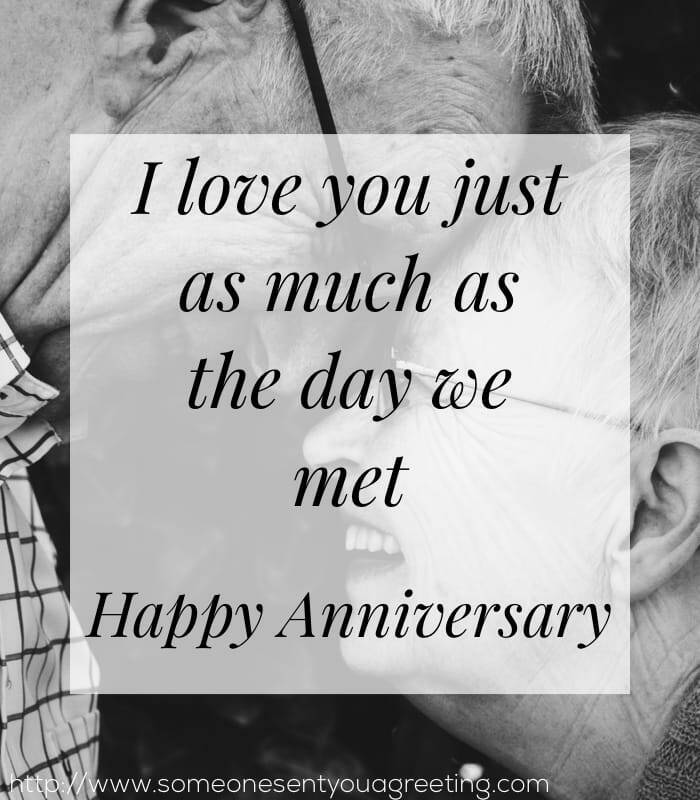 But anniversaries go all the way through newlyweds, families and onto the more mature couples who are hitting the big milestones like silver, ruby, gold and diamond. Love that sustains and remains through all the testing times life brings should be cherished and respected. The way you can celebrate the anniversaries of others is to send an anniversary card. This gives you the opportunity to express the way you feel about their big day. 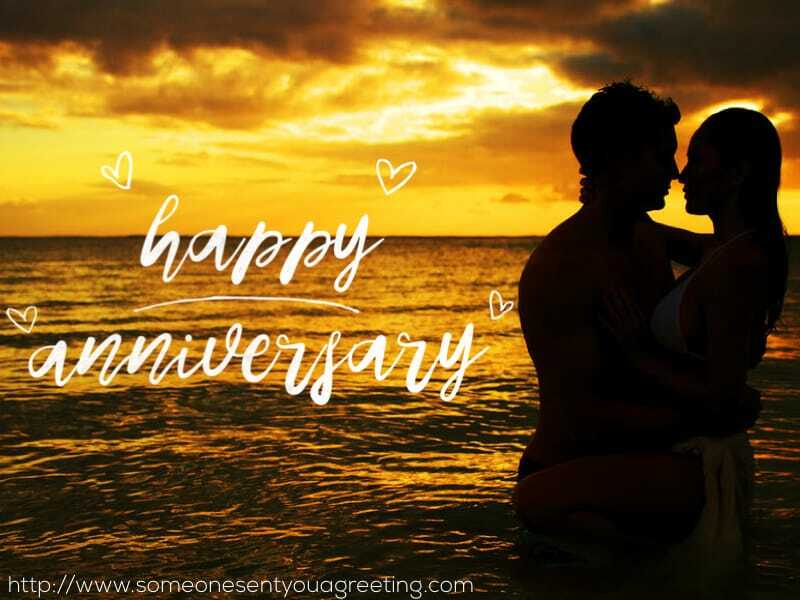 Maybe you want to offer them congratulations, pay tribute to their enduring legacy of love, recall a funny anecdote involving the couple or just wish them a happy anniversary. But choosing the correct words is sometimes easier said than done. Some people find writing their feelings or emotions difficult, others just aren’t sure what sort of words to use. 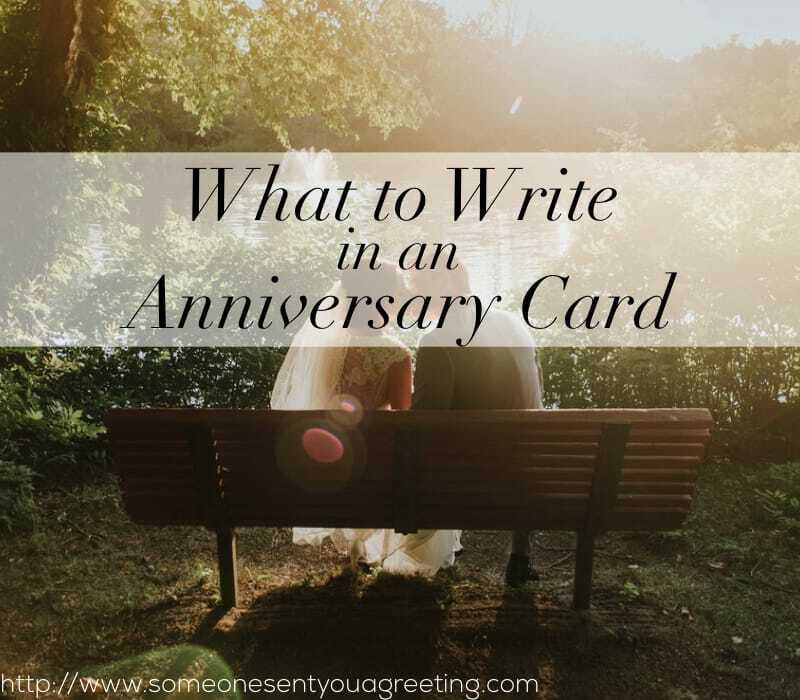 So if you’re struggling with what to write in an anniversary card then below you’ll find a selection of anniversary wishes and card messages. They cover all the different types of anniversaries and recipients, from family and friends to your spouse and big milestones. We’re confident you’ll find exactly what you need to inspire you to write your own wishes or find the most appropriate example for your card. If you’re intent on writing your own anniversary wishes and messages then you can follow a few tips to make sure you hit all the right notes. Try to handwrite it. Sending a text, email or even a printed message has it’s place but for something as important as an anniversary then stick to writing it yourself. It’s not too much effort to use a decent pen (one that doesn’t blob or leak!) and some lovely stationary or card. Think about including your anniversary message as a letter or note within a card. A card on it’s own is fine, but for your spouse or someone special you might want to write a bit more. So consider including a longer message on a separate piece of paper inside your anniversary card. Don’t panic about what you’re going to write. Speak from the heart, try not to feel embarrassed about what you’re saying and remember it will come across far better than you’re probably imagining in your head. If you’re still worried then you can do some rough versions first to test the sort of words you’re planning on using. Then pick your favourite to use as the final version. When writing your message go into detail. Use anecdotes or past experiences that are personal to the recipient. You want it to seem personalised and as if only you could have written it, rather than sounding generic. You can also try to be funny or cheeky if that comes naturally. Be effusive. Now isn’t the time to get shy or feel silly about what you’re thinking or saying. Try to let go and say whatever it is you’re feeling. The recipient is probably a loved one so you can be gushing about them without fear of it coming across as over the top. Finally – enjoy it! Anniversaries are special times so enjoy the magic of a wonderful day. Try some of the examples below to give you some inspiration when writing your own. Warmest wishes to an amazing couple. Happy anniversary! Heres to many more years of your happiness! Congratulations on another successful year. And no doubt many more! Congratulations to a brilliant couple. You’re an inspiration to us all. Your Anniversary Day is a special day. Best wishes and enjoy it! If it’s your own anniversary then write from the heart and express exactly what your partner means to you. Don’t worry about sounding silly or getting it wrong. If you are concerned then use the examples below as a guide on what to say. Still together after all these years, still as happy as could be. Happy anniversary to you, my love, my rock, my everything. To the sweetest guy a girl could hope to meet. Happy anniversary! Major milestones like a 20th, 30th, 40th etc. anniversary is a huge achievement and so should be celebrated as such. Use the examples below as inspiration for your message. A huge congratulations on reaching an amazing milestone. Take the opportunity to let family members know how much they mean to you and how much of an inspiration they are. Grandparents and older relatives may have had long marriages and set examples to the rest of the family. Or you may just want to let newer family members know how much you enjoy having them as a member of the family. Congratulations on your anniversary mom and dad! I can’t believe my little sister is already celebrating her 1st marriage anniversary! Congrats! Happy anniversary bro. Still can’t believe you managed to find someone willing to marry you! Join in the celebration of a friends special day by sending them a warm message of congratulations. Be that simply wishing them a happy anniversary or something more personal like an anecdote from your past that only you share with them. 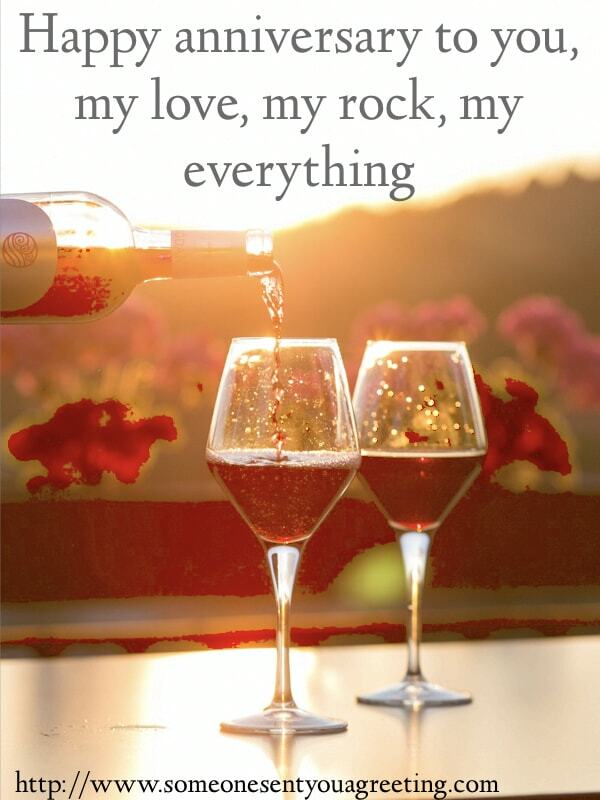 Here’s to a special couple! Happy anniversary guys, enjoy! To my dearest friends – have a wonderful anniversary. You guys are the perfect couple and we’re so pleased you’re in our lives. Wishing you two a brilliant anniversary. You’re some of our favorite people and it’s great to see you celebrating another anniversary. Enjoy it! We’ve shared so many good times together we’re forever thankful you’re in our lives. Have an amazing anniversary! An anniversary is a time of joy and celebration, but can also be a time of laughter. You can use these humorous and witty wishes to put a smile on the couples face. Happy anniversary! Here’s to another year of pain and suffering. I’ll love you even when you’re old and wrinkly! Love means commitment. Of course, so do most mental illnesses! Wishing you both a Happy Anniversary. Marriage means commitment. Of course, so does insanity! Happy Anniversary! Now if I can just remember your birthday this year. The longer you’re with someone the more you rub off on each other. So I don’t expect that at this point there is much of you left as individuals. I thought that a condolences card was more fitting for you for our anniversary. 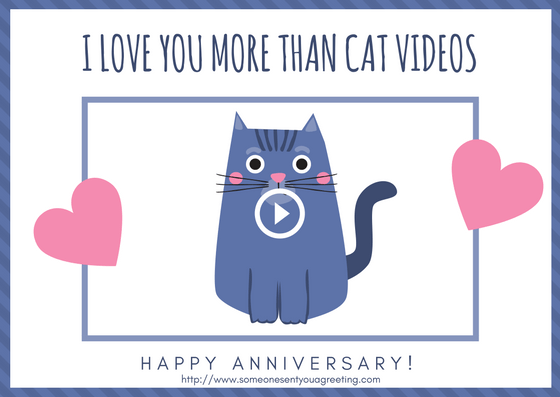 Be certain that the couple you are sending your anniversary card to is open to receiving a funny message. You might risk offending them or coming across as not taking it seriously. If you are confident about their sense of humour then go ahead with the funny message but if you are in any way unsure then it would probably be advisable to avoid doing so.